fabulusfab's review (This content has been automatically translated from French)" very useful tool, I am happy with this purchase"
multitrack recorder that apparently not breathing necessarily quality (all plastic) but for its price offers interesting features and practical for recording. - The impossibility to combine internal post processing effects (eg you can not get a micro simulation effect male voice and a reverb! Must make a choice). say that these spots disappear when the treatment is continued on computer audio. we can say that it is rather plug and record!! AlexandreC's review (This content has been automatically translated from French)" A good plan"
It is a device that I use multitrack recorder on AC only. I have not tried their other features. The preamps are a little cold. There is distortion or noise when pushed to the bottom. Some effects are not really terrible. Fortunately there is a wide choice. Beware of jacks that can be caught in the catch if they are pushed to the bottom (yes that's preamps ...). I think the race sliders is a bit short but it can also be an advantage insofar as it makes a very compact device. Value for price: this price for what you record good quality models. this device is both very light and compact. It comes Ready to use with an SD card! The menus require a period of adaptation to navigate but we made it fine. Yes I remake this choice without hesitation malgrès its few flaws, it's still quality material quite good for a small price. Ben WDCK's review (This content has been automatically translated from French)"# 1 on the market"
I wanted to buy a digital 8-track recorder, recording eight tracks simultaneous was what influenced my choice! I play in several groups, and to make a demo we used 12 tracks: 5 drums, a rhythm guitar, a lead guitar, a bass singer two microphones (stereo), 2 microphones chorus (stereo), connected via XLR Mic, except for the lower branches with DI. I bought it mainly as a digital recorder, the interface which is interesting to me, will be of little use. As it is written I have used it with 8 simultaneous tracks. The configuration of the recorder is as easy as possible, although the manual is essential to make the necessary adjustments, you often have to press several buttons for settings, the screen is from another age, but generally it's pretty simple. The manual, which was in English, I also found it in French, it is very complete, I also found the manual very complete when it comes to the audio interface. I use it for one month already , but be aware that I ordered a 3 months ago, and it had some problem, it crashed and after several uses the card reader was out of order, luckily the retailer refunded me . Before that I had a little 4-track Korg, an input ... nothing comparable. What I like most is the ability to finally record 8 tracks live on a very compact model, the sound quality is decent, with dozens of effects, equalizer settings is also very interesting. What I like least, that one can say is the certain fragility of it all, it's plastic, the connectors are quite delicate, we have to go slowly not to risk breaking it! And above all the settings for maximum simplicity registered, because I do not find them especially precise enough to measure the input signal coming from the instruments. But overall, on price/quality ratio level, competitors are way out there! I would repeat this choice without any problem! Wills01's review (This content has been automatically translated from French)" Excellent"
I was looking for a good multichannel super reliable for continuous recording 8 channels over an hour (recording musical theater shows). I did not want to invest in something too expensive, because for my use is not very frequent. I use conventional microphones for recording in rooms and I get the data stored on the SD card to move music files to my sequencer, process and mix. In the context of my employment, there is no need for drivers. You just need a USB communication for retrieving data. No problem on that side. Is recorded without problems on 8 tracks in parallel and continuously. I just regret that we can not cut a track from time to time. Once started recording, you can not change (it is also a safety). I insist on the fact that every time my recording went through without flinching! (More than one hour continuously). Sounds basic but it is not so common! And to have had records cut during the show, I can say here that that really irritates! I did not manage to install the R16 sound card on my PC with Win 7 64 bit. Given my use and the fact that I have another sound card, so I do not care so much to be honest, but I must say it did not work. The manual is well done, but the the Web site support, is very average. I've done four shows with it. No problem to store and retrieve the sounds. So, for this purpose, it is perfect (for the price!). For cons, I think if we start to want to put effects, panning ... the ergonomics of a tiny display, it is impossible to do or a very risky operation. Then I would not recommend this one. So if you just want a reliable multitrack recorder, light, cheap and easy to use: it is the best! Note: I see that all those who have given advise used as a stand-alone recorder and I'm not exception. As a sound card or even effects processor ... bof! will_bru's review (This content has been automatically translated from French)" The Swiss army knife of home-made demo"
With 8 recordable tracks simultaneously, it is really one of - if not the - best value for money products in this range. Regarding drivers, I have a problem: I am forced to disable wireless network interface. Otherwise, it happens at the interface "curling" and completely block the sequencer. I use Reaper, but I also tested the version that comes with CUBASE LE4 interface is quite functional (except of course the wifi network adapter). Namely that also recently Zoom released drivers (regularly updated, on average every two months) to run the R16 with Windows Vista 64 bit (I'm 32-bit, and with 4gig of RAM, I do not need more). To install, if I had clues about the wireless network card that made me doubt for a long time the state of the equipment, nothing to declare, just read the doc, and everything happens as with most hardware of this type. Nothing specific to report. Things to know also that the updates are super simple to implement. The material, a bit rough (but not in the explanations in the logical order of chapters) is more than enough to get their hands on all the possibilities of the machine. At the same time I knew about I purchased it, and for the price you have to be happy with that, but it is true that LCD is still rikiki hack and requires to press 15 times the same button to get to that menu you want. But hey, it's still manageable. So obviously my grades are very high, but we must place them in relation with my needs. We can of course find tougher integrated preamp, cards with more inputs / opportunities, etc.. But I have found the rare gem. Only 8 tracks at this price. By 8 tracks, includes recording. Reading, tables on the double. Otherwise, you can only record on the first 8, so we must move each track to the 9-16 range in order to really exploit playback 16 tracks. It is fastidious. Writing to SD card and SDHC up to 32 GB (efficient, reliable, inexpensive, often found in cameras, SD card slot available on most new phones). Access to the SD card is on the side and is freely open (and another on TASCAM BOSS, unscrew a hatch before having access to it to me is unacceptable). Output format. WAV directly usable on a PC (Yes, I'm not very patient and I understand why brands like TASCAM or other use proprietary formats for which it must wait 3 plombles vi export a USB cable). 2 XLR input with phantom power, a high input impedance, 2 mic, the offer is complete. Do not rely too much on the quality of the preamp for low back entrance cons, need to dream .. Intelligent positioning of mics up and NOT on the facade, which can record on a desk or on the floor (Not the case with TASCAM or BOSS). Same with the headphone jacks or any other which is located on the bottom of the device and not on the front. VU meter and peak meter readable from a distance and in the dark (the competition is on TV, good luck to know where you're at a distance). Real faders. Portable (fit in my house for guitar TOBAGO) and running on batteries (6 R6 for roughly 4 hours). Packed ZOOM effects are provided and are is still mediocre (chorus reveb, ect ...). For me it is a recorder, the rest will be done on a PC. A metronome sound / video is also included as well as a tuner, AC can troubleshoot. The unit of measurement can be temporal or by measure. I do not know if it can do MIDI sync via USB cable, since I'm not interested in that. You can use it as a SD card reader by connecting it via USB, the transfer rates as fast as a standard card reader. You can also export your decision on USB, USB port is provided (practice at the end of a rehearsal I guess, it is seen that each have the mix of rehearsals). You can also import WAV file into a project. 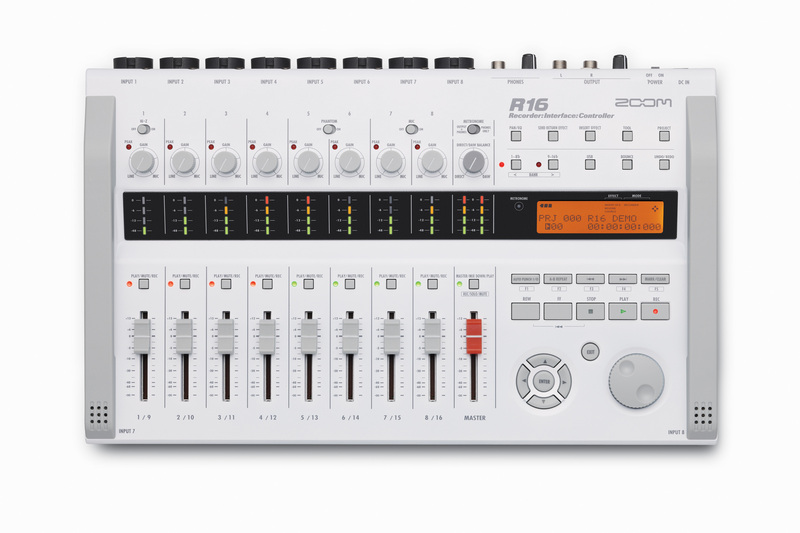 You can extend it by 16 tracks with a 2 &deg; R16 will sync via USB. Last important point: QUIET! No fan, no mechanical movement. Obviously do not send or insert for each track for that price, but it should be possible to fiddle with 2 output jacks to the format, I have not tried. I had to re- install as it would not finish (stuck at 100%). After killing the process, Cubase is there and functional, go. Activation of Cubase 4 with syncrosoft abominable (10 minutes with pross 100%) but it is, be patient and not imagine that the process is in the process of bugging. Can not run it on windows for a license problem. Mail sent to the support that Steinberg did not answer. You gourr&eacute; not the first installation with this s. .. protection. My advice: ghost machine blank not to take the lead with just over Cubase validated. EDIT: Bootcamp is not officially supported by Cubase, if it works, fine, if it breaks- too bad for you. Control the fader in Cubase which poses no difficulty, it's nice. The manual is not bad, teaching, procedure by procedure, so boring to read in the Metro without the camera in front. 3 Weeks that I have it already. Not much to recoil. The button click sounds fake, it's unpleasant. Ergonomics is clearly not the strong point of the unit as often, but it's OK. The sound quality is fine for this price, no breath detected yet, but I did not grow. The headphone clearly lacks juice, one must turn it full on. At times it is a clickodr&ocirc;me, and it remains a negative. 2 examples: New Project = 5 clicks on the button project. If you want to move a track is Click button swap, click Enter button, click source track, click track, click enter, click exit ... Extra! I guess that here, or in competition which provides a stereo card, Zoom provides here 4 times that and it is certainly not the same quality. The mics are correct for the microphone and will do for now, but if you have a Shure SM57/58 lying around in the corner, please. I made the take with the mic, a Shure SM58, an MTA 4033 and a Rhode NT2 on a guitar and a voice to compare. You'll find them here: http://john.fender.free.fr/Export/AF/ZoomR16FirstTakes/, it will give you an idea of ​​what to expect level mics. It served as a musical notepad to record in a studio (in particular to record the drums). Not bad, and anyway I have not found better: it's still an excellent value for money. I do not recommend this type of device to the mix unless you are a puppeteer. With a PC with Cubase or Soundforge you will go 10 times faster with a much better quality and comfort. For those who want to go further, I recommend the RME 400 UC.